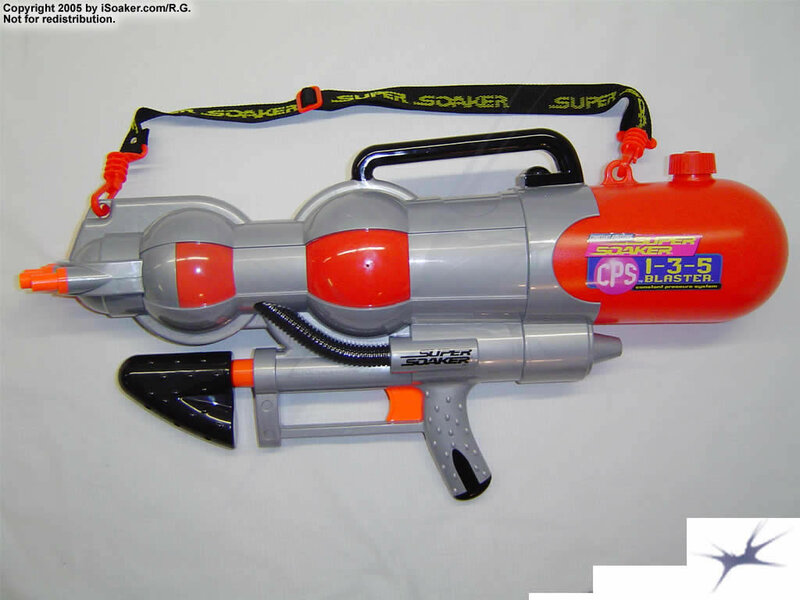 The Super Soaker CPS 1-3-5 has the same size and generic shape as the Super Soaker CPS 1500/CPS 1700. However, instead of sporting a single aperture with dual nozzle sizes at its front, the CPS 1-3-5 has 5 nozzle in a fixed-fan-spread alignment. The blaster does not have a separate selector switch for nozzle use. Instead, one, three or five streams can be fired simultaneously from the CPS 1-3-5 depending on how hard one pulls on the trigger. This allows the CPS 1-3-5 user to quickly and easily switch between single or wide-burst shots when needed. The reservoir and firing chamber capacities of the CPS 1-3-5 are very respectable. As well, the CPS 1-3-5 has both a top-mounted handle and shoulder strap to ease carrying this blaster. A common complaint regarding this blaster lies in its nozzles. Each nozzle would only receive a (1x) rating. The fact that they are fixed in a fan position also means the chance of hitting a target with two or more streams is unlikely unless one happens to be quite close. At the same time, the fact that this blaster can provide a good spread of water beams means that large groups of people can quickly be hit with water in no time. Comparing the Super Soaker CPS 1-3-5 directly to other blasters this size would not be fair; the CPS 1-3-5's role should be considered either as a long-firing light assault rifle or a decent suppression weapon for dealing with masses of enemy troops. Good against any XP-class blaster and decent even against CPS-class blasters, the Super Soaker CPS 1-3-5 has its uses, but its strength really lies in who uses it. Mid-sized, good capacity blaster with a large firing chamber and long shot times. The ability to toggle between 1, 3 or 5 streams just be squeezing the trigger harder or softer makes nozzle selection quick and simple. The shoulder strap and handle for carrying is a bonus. Five 1x nozzles in a fan spread does not allow for fast saturation of a target. 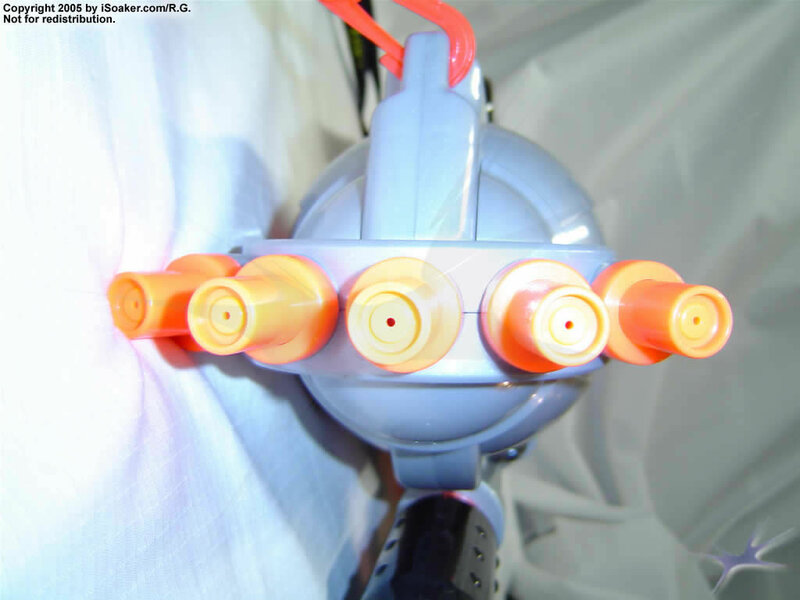 The fixed angle between the nozzles means that targets have to be at a certain spacing to be hit by the multiple streams. 2001 was really starting to go downhill for Super Soaker, and the CPS 1-3-5 really does show that, and to me is one of the worst Super Soakers ever made. This is when stupid gimmicks that are mostly around today just got accelerated. It doesn’t help how it replaced the CPS 1700, which is like getting rid of Liam and Noel Gallagher from Oasis and replacing them with Simon Cowell, not good. At least the CPS 1-3-5 in terms of structure and design shares nearly all the same aspects of the 1500/1700. It holds around the same amount of water for both the reservoir and firing chamber, has the same sort of pump and pumping times to get to full, the usual strap and handle just in a slightly different frame. So in terms of simplicity in just filling, pumping and using there’s nothing wrong. Finally, Larami must have known and purposely done this, this blaster is pretty durable, it can take a beating, this was the first CPS I got and at that time I didn’t take as much care as I do now (I was at that young and more careless age of around 12 then), and most of the time it was left outside all winter, even sometimes with water in, and it still worked after all this lack of care, it is understandable that it can get treated badly since it did replace the 1700, one of the best blasters made. I don’t know where it is now as I left it at someone else’s house years ago. It also has a pretty long shot time if one or three streams are fired. Now the crap really hits the fan here and then some, the whole house collapses really. All because of instead of the more simple soaking nozzle approach, instead we got this stupid gimmick of being able to fire out 1, 3 or 5 nozzles horizontally depending on how far the trigger is pulled back. Totally useless to me, given the nozzles are only 1x in output and you’d still struggle to hit a fat man effectively. You could fire the blaster sideways, but you shouldn’t even have to do that each time to actually be more effective with a blaster. For a CPS blaster, it’s pretty sad; the firing chamber in terms of power, range and soakage is pretty weak. The pressure sensitive trigger that determines how many nozzles you’ll fire out of after a while wears out, so you’ll actually be stuck firing out five nozzles until you pump it some more so that the pressure makes the trigger valve pull back to just one nozzle, which is what is best to use most of the time. It is still a massive inconvenience though. This makes the CPS 1-3-5 as a whole not worth buying at all. It is basically a bigger XP 85 (which if you read over the net is also terrible), that uses CPS and two extra nozzles. It is just so bad, yes it might be good at beating a fair few air pressure blasters, but this is a CPS, and this blaster due to the stupid gimmicky nozzle feature and low power means it is outdone by pretty much every other CPS line blaster made. Honestly I’d rather run around with a thousand insects in my pants in a water fight than use this, it’d be more crazy and entertaining. The cheesy space aged design would have made the blaster good if it had power and not stupid gimmicks, however since it is not it is just cheesy and crap. Simply put; don’t, run around with a thousand insects in your pants if you have nothing else instead. If you do, then a lot of XP’s are beatable, anything CPS or just large air pressure then put it down. Smaller air pressure XP’s watch out. A simple CPS like a 1000 or Splashzooka and even XP’s like the 95 and up are enough to give a 1-3-5 user trouble and look weak for its size. The CPS 1-3-5 was released in 2001 and originally was supposed to replace the CPS 1700 (one of the best soakers ever). But Larami made a huge mistake on this gun: the 1-3-5 has 5 nozzles fixed in a fan blast position. Each nozzle has a 1x rating, all of them have bad range and all 5 nozzles could not hit the fattest person. If you turn the gun on its side all 5 nozzles might hit. The CPS 1-3-5 has a interesting trigger system; pull it a little bit, it shoots one nozzle; pull it midway, it shoots three; and pull it all the way and it shoots five. The trigger is pretty sturdy and won't break for at least 3 years. Overall the CPS 1-3-5 blaster was a FAILURE but it can beat almost every air pressure gun except the better ones like the SS300, XXP275 and XP150 and it’s a good gun if you fight a lot of small air pressure guns or don't mind four extra nozzles. Otherwise, just forget it.